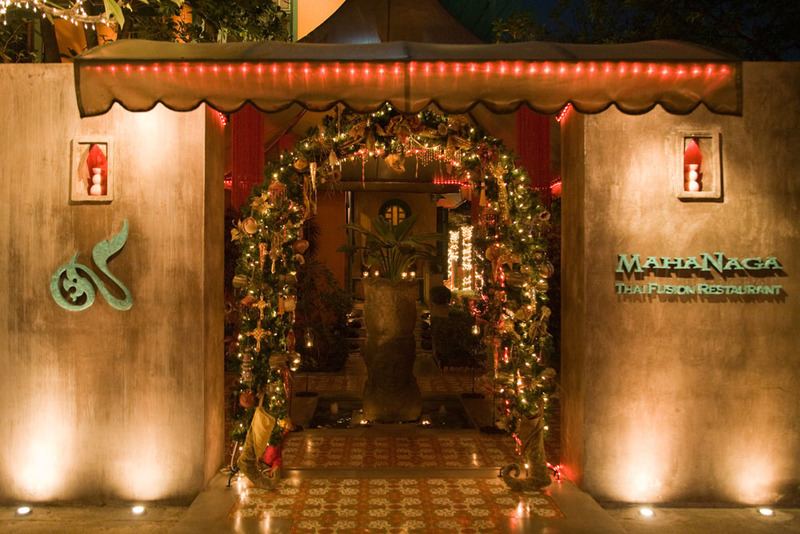 For a special Thai food experience, Maha Naga will not disappoint. One may wonder why pay more, when you can get Thai dishes on the street for 30-80THB (USD / SGD). But for me, it is the equivalent of a topic of heated debate among most Westerners no matter where one lives – the best burger. To make the comparison plain…sure, you can go get a fast food burger that costs next to nothing, but sometimes isn’t that handmade bistro burger with hand cut fries for 5-10x more in price completely worth it? 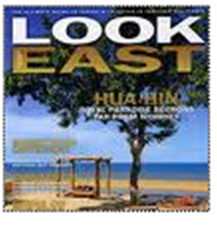 Which brings me to Maha Naga in Bangkok on Sukhumvit Soi 29. Yes, there is cheaper Thai food on Sukhumvit, but if you are looking for something special, you can’t miss with Maha Naga. 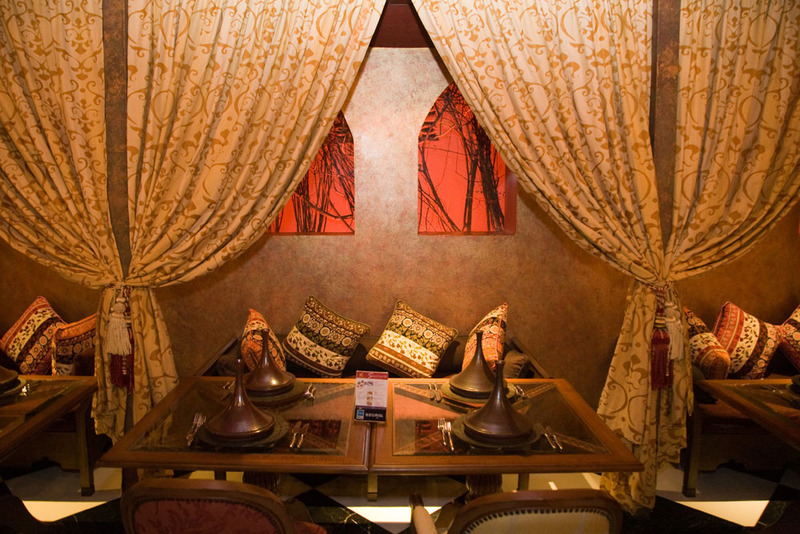 Maha Naga features traditional Thai and Thai fusion, but what really separates the place from other upscale Thai dining options, is the atmosphere of exquisitely decorated Thai houses in which it sits – featuring a blend of Thai, Oriental and Moroccan influences. Three Thai houses (or “baan” when said in Thai) have been joined together in a circle to create different dining pavilions with a sumptuous garden and fountain with billowing silk banners at its center. It is at once….delightful, yet romantic….quaint, yet polished…exotic, yet homey….magical, yet soulful. For me, it has been a “go to” place when I have visitors in town. 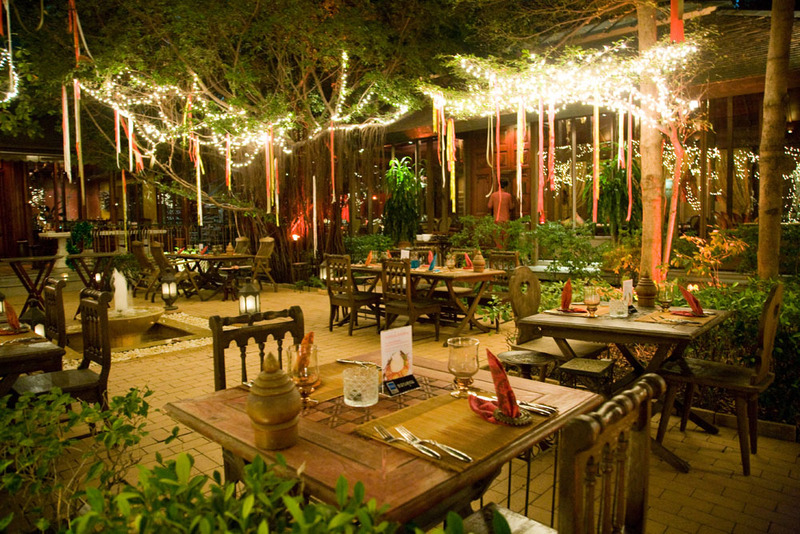 Sometimes just for drinks and appetizers in the elegant and graceful Thai / Morrocan style bar and other times for dinner in the Thai style courtyard lined with water-filled pots overflowing with lotus blossoms and koi (make sure to spray for mosquitos!). 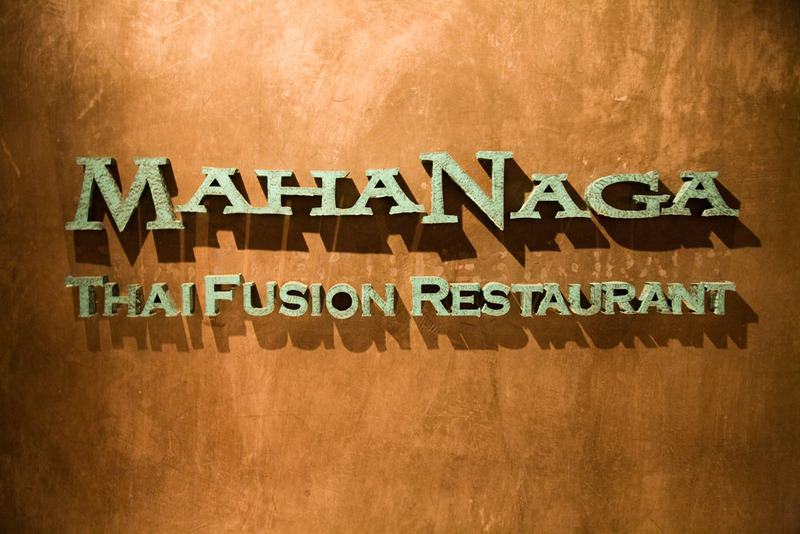 In fact, my first experience at Maha Naga was my welcome dinner when I moved to Bangkok, but even after being a longer term resident, I returned time and time again to enjoy the experience of dining in this most unique and spellbinding of settings. 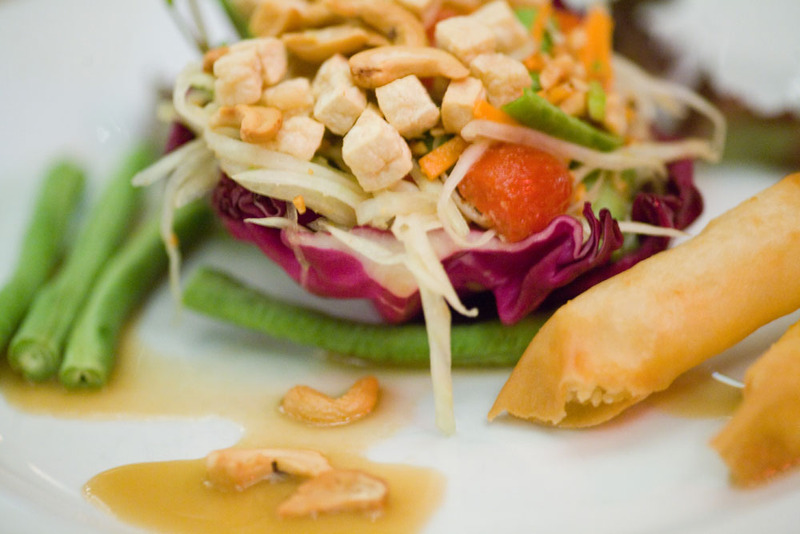 Over the years, I have sampled many dishes from the Thai and Thai / Western fusion menu. In my experience, I would say stick with the Thai menu. Maha Naga has upgraded many ordinary Thai dishes to the make them extraordinary. For example, Som Tum Thai salad (150THB) featured green papaya with fried cashew nuts and fried sticky rice, instead of the usual presentation with chopped peanuts. which was a pleasant upgrade to an already much-loved dish. Also the Yam Poo Nim Mamuang (260THB) – a lovely spicy mango salad, was elevated with the addition of deep fried soft shell crab. A typical fried fish cake, compliments of the chef, was elegantly presented in crispy fried wonton wrapper rolled to a baton shape and served in a silver plated cup. 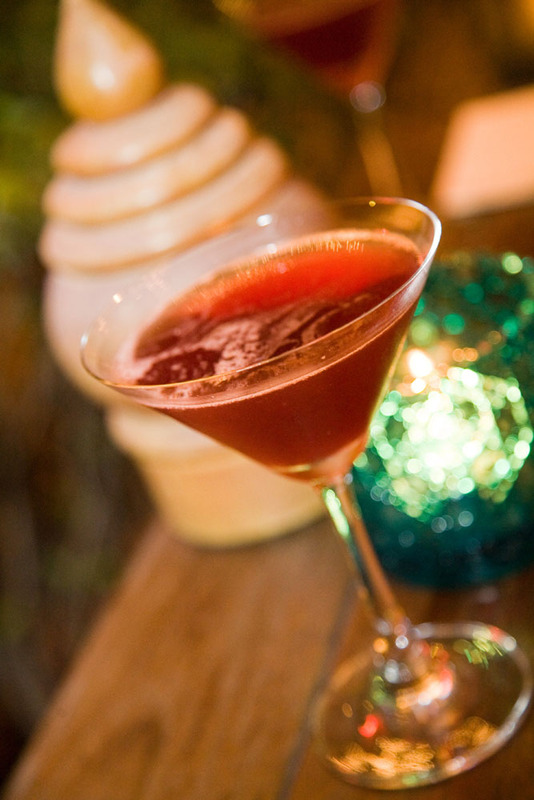 • Maha Naga Signature Cocktail – a cocktail served martini style, combining vodka, triple sec, grape and orange juices. • Poo Nim Nam Makam Prung appetizer – deep fried soft shell crab topped with herbal, sweet tamarind sauces and garnished with deep fried garlic, shallot and cashew nuts. • Satay Ruam appetizer – assorted pork, sirloin and chicken meat skewers served with pita bread, peanut sauce and sour cucumber salad. • Massaman Nua entrée – beef with yellow coconut curry sauce with sweet potato mash on the side. • Goong Mai Nom Nueng Nom Sod entrée – steamed blue river prawns with spicy milk cream sauce and glass noodles. • Ganeng Khiew Wan Pla Hima entrée – pan fried snow fish fillet in green curry coconut sauce with jasmine rice. As there is no much complementary to say about Maha Naga, it is a wonder there is anything to criticize. With that said, I will tell you myself and other guests have noted that the more fusion of the dishes and occasionally the desserts simply lack spark. So eat your steaks, lamb chops and Western-style pastry desserts elsewhere and focus on the heady and unique flavours of Thailand when dining at Maha Naga. on christmas eve, we went in for dinner at 8.20pm. After 9 someone came to our table. we made some compliant to the owner, and she said it was our fault not to make reservation. we were too hungry to even to get mad. Food was brought to our table hour later. During the wait, my wife and I a simple drink of water, and so hard some waiter would care to ask for a refill or more drinks. At all. We asked four times. finally food come with spicy pamelo salad with no dressing! We went drinkless, waterless, and serviceless. i feel sorry for myself sitting there waste my time at Mahanaga. I am a millionare, and i had one hundred dollars for a tip. I left under four dollars. WORST SERVICE EVER. And absolute embarresment. If i was the owner I would not be in this business any more. I will tell everyone in the world to never come here !?! !? !